The production capacity of REK Bitola, the biggest power plant in Republic of Macedonia, is around 80% of all the consumed electric power in Macedonia. Regarding that fact, the Suvodol and Brod Gneotino mines, are the vital points from where the plant receives coal, in table 1 I have presented the measured installed power of the both mines and their power blocks. From these measured values, the National power transmission company gave us the power factor of the mines, which is presented in table 2. You can see that the power factor is on a pretty low level, so a compensation is definitely needed in these mines. The calculations and analysis are made based on the most severe working mode (all mining machines work with nominal active power and the reactive power is 20% of the active power). Several analysis have been made for different PF of 0.98; 0.95; 0.9; 0.8 and 0.6. All analysis for the different PF shall be presented in the following tables. 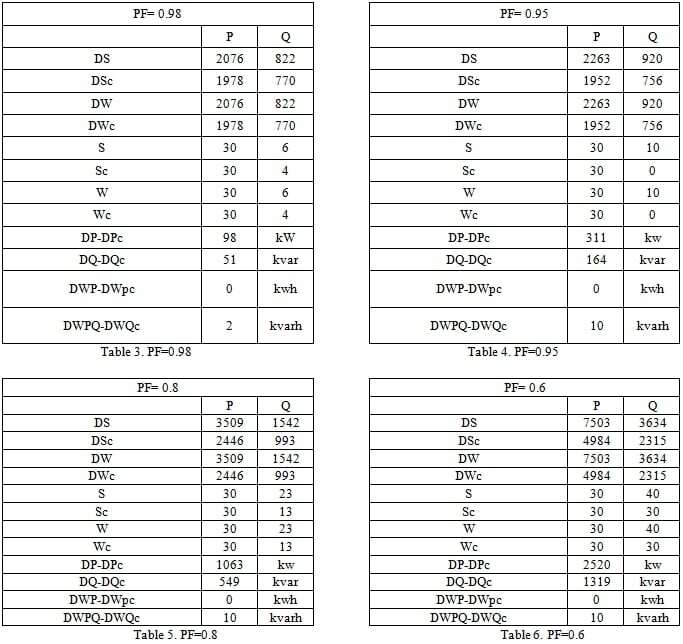 The DS values in the tables are actually values for the losses of apparent power taken from the feeder network for uncompensated network. The DSc values are for compensated network, while the DW and DWc values, are actually losses of active power and reactive power for uncompensated and compensated network, respectively. The voltages for the specific nodes in the network for uncompensated and compensated network are shown in the following pictures. On the pictures, on the X axis we have the nodes in the network, while on the Y axis the voltage level is presented. From the pictures you can notice that the worst case is in node 51. On that node is the biggest voltage drop in the uncompensated network. When the network is compensated, you can see that the voltage drop is actually below 10% of the nominal voltage. As I have said in the previous section of the article, the most critical point in the network is node 51. Some measurements (daily diagrams) have been made. The results are presented in the pictures below in this section of the article. As you can see from the pictures 3,4 and 5, we are facing a situation with enormous power losses in Suvodol mine. Therefore, we decided to install compensating batteries in the network, in order to increase the power factor. With those static compensating batteries installed in the network, we made some calculations how much money we will save annually. By using different methods for power compensation, where there is need of such method, there are many benefits to all users. With the compensation that we used in our case, besides the annual savings, we have drastically improved the power quality in the nearby transmission lines, so there is no need of reinforcement of the transmission and distribution systems. We strive to implement power electronics in all other critical nodes in the network, so we can improve the network and achieve PF of 0.98. Do not hesitate to leave comments and ask questions! or copy this trackback: http://engineering.electrical-equipment.org/power-quality/compensation-reactive-power-6-kv-network.html/trackback from your own site.